Free Shipping Included! 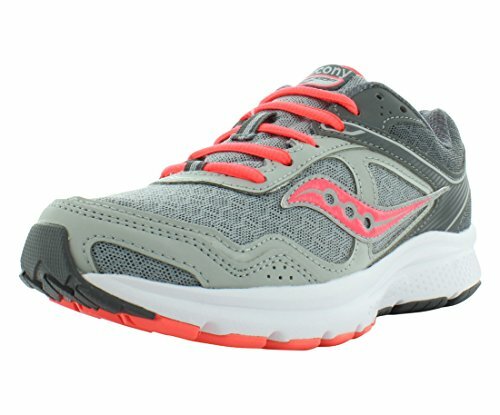 Saucony Women's Grid Cohesion 10 Grey/Coral Ankle-High Running Shoe - 9.5M by Saucony at Envy This Stuff. MPN: S15333-17-027. Hurry! Limited time offer. Offer valid only while supplies last. Build a beautiful harmony with your feet and shoes in these running sneakers. Built for the neutral to underpronator looking for a cushioned ride. Build a beautiful harmony with your feet and shoes in these running sneakers. Built for the neutral to underpronator looking for a cushioned ride. Breathable mesh and synthetic upper materials. External heel counter aids in stabilizing the heel. Reflective hits for added visibility in low lighting. Plush tongue and collar. Breathable fabric lining for a great in-shoe feel. Removable foam insole. IMEVA midsole provides increased shock attenuation, responsive cushioning, and lasting durability. Heel Grid system for stable cushioning in the heel. XT-600™ carbon rubber outsole material delivers optimal abrasion resistance and traction. Imported. Measurements: Weight: 10 oz Product measurements were taken using size 9, width B - Medium. Please note that measurements may vary by size.